When people don’t feel well, they want to know what’s wrong and what they should do to get better. And in the quest to feel better, these days people turn to the internet to find answers. Consider this vital statistic: Pew Research says that 77% of online health seekers begin their journey to wellness on a search engine such as Google, Bing or Yahoo. So, if potential patients are using the internet to find the who, what, where and how to find the cure to what ails them, healthcare providers need to be on the internet in order for those potential patients to find them so they can, in turn, treat them. The digital health revolution has created a need for digital marketing in health care. Though many doctors may cringe, the reality is that access to information online has led people to diagnose their health issues on their own. And people are not always so discerning when finding their answers as the reliability of sources that this information derives from can vary. 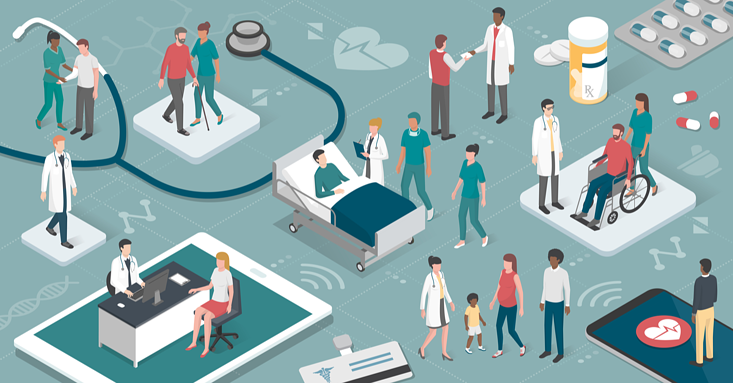 From reputable sites such as Mayo Clinic and WebMD’s Symptom Checker to random social media influencers who may or may not be medically qualified, people are receiving lots of diagnosis and treatment information digitally. Through articles, blog posts and videos that speak to the symptoms they’re experiencing, people often believe in and rely on the knowledge and recommendations floating around the internet – whether they are true or not. Content that lends itself to candidness and anecdotal truthfulness can boost people’s loyalty to them, so healthcare marketers should keep this in mind when creating this content. When someone feels sick, they are aware that they have a problem and that inaction could result in unwanted consequences. Once that person has clearly realized that something is wrong and is committed to getting better, they consider different approaches to getting better. Lastly, they will decide on how to get better. It’s during this process that health care companies and providers need to ensure that they will appear to patients during their online searches. Similarly, healthcare providers strive to provide good patient experiences throughout the continuum of care. So if a provider wants to gain new patients and deliver high quality experiences from beginning to end, it is vital to begin that patient experience during the research stage which happens online. In order to deliver the type of content that is relevant to a patient’s search, the Google algorithm favors quality, mobilized websites that have fresh content such as blogs, videos or webpages. Marketers should build their strategy around creating helpful content and carefully-selected keywords and topics. This is the best pathway to ensure your practice is being found online and you are being positioned as the expert or authority in the space. For example, if a patient is looking for information on how to soothe an aching lower back, they may search “treatments for low back pain” or “how do I treat low back pain?” That search could lead to a specific piece of content focused on those search concepts like a blog by a physical therapist “5 Best Pain Treatments for Low Back Pain.” This blog may include a form to fill in contact information or to make an appointment which give you options to communicate with the potential patient. All in all, the strategic process is the inbound marketing philosophy: the goal of attracting a potential patient by providing helpful content that leads to eventually converting them into loyal patients. In this day and age, with the popularity of online research, the loyalty-building truly starts online. Your digital marketing strategy is a vital part of setting the tone for the patient experience before the patient even walks into your office. After all, don’t you want your patients getting their advice, and eventually treatment from you, not an online resource who may or may not be qualified? Consult an Ironmark digital marketing expert who can put you on the path toward an evidence-based marketing strategy for gaining new patients and therefore more revenue.